So we’ve all been there when we look at our skin after putting makeup on and it just doesn’t look as smooth as it could. The key to getting the smoothest skin is having a good routine with good products that actually work. I use exfoliators regularly and I think the biggest key is rotating which ones you use, you might not even have known there were different ways to exfoliate huh? Let’s jump into exfoliating 101. I wrote a whole post on exfoliating here if you want to read that as well but I’m going to go over most of it below. Basically, exfoliating is bringing new skin to light by shedding/exfoliating the dead skin cells and layers off. For your face specifically, the different ways to exfoliate are microdermabrasion, peels (alpha hydroxy acids (AHAs), beta hydroxy acids (BHAs), facial brush, scrubs, facial beads, abrasives, clarifying lotion. For your body, there are some different ways to exfoliate as well such as pumice stones (feet), body brushes, loofahs, sponges, washcloths, shaving, waxing, scrubs, facial beads, abrasives, exfoliating creams, and lotions. So recently I’ve come across and amazing brand that has tons of exfoliating products like peels. scrubs/micro-dermabrasions, etc. I have tried the Glycolic Extreme Peel and the Glycolic Gommage Extreme Renewal. I’m obsessed with both because they give you an instant glow and smooth skin after just using them once! The peel is awesome because it has little tiny aloe vera beads in it. You apply it all over your face for 10 min then rinse it off. My skin is seriously smooth and bright after ONE use. I use this one at night and in the morning I am pleasantly surprised with my skin’s texture and smoothness. Reveal new, fresh skin (removing dead skin also lets your skin soak up your skincare products better). Get rid of dark spots and acne scars/ even out skin tone. I hope you enjoyed the post and learned a new way to get fresh, glowing skin. Happy Weekend! 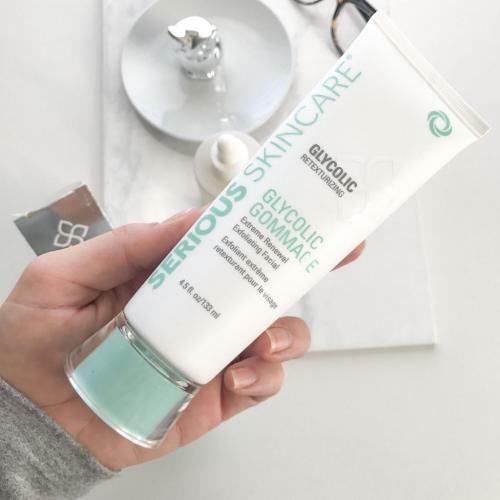 Thank you to Serious Skincare for collaborating with me on this post.